Imagine one needs a bearing that can accommodate loads in both axial directions and provides a very tight axial shaft position tolerance. 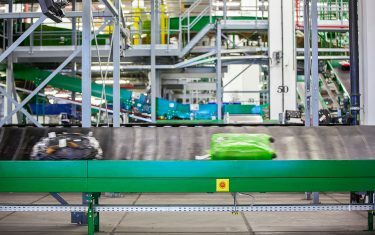 Four-point contact ball bearings in the QJ series are unique by design and they indeed can provide this, even in a very axial space-saving design. Four-point contact ball bearings (QJ bearings) are a specific type of angular contact ball bearings. 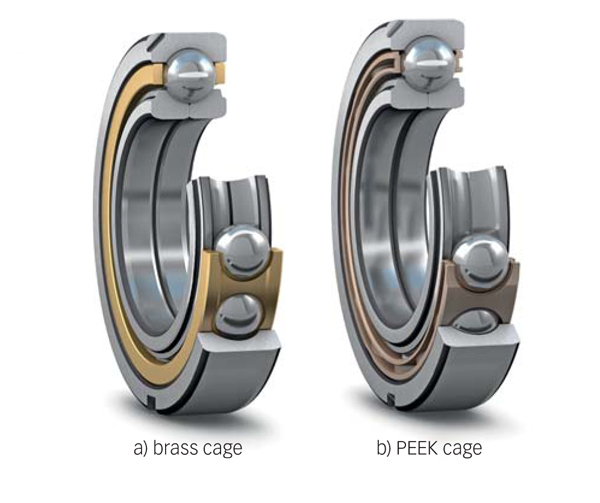 In many applications one QJ bearing is an interesting alternative to a matched set of single-row angular contact ball bearings. Indeed, its space-saving design, the speed capabilities and the load carrying capacity are remarkable. 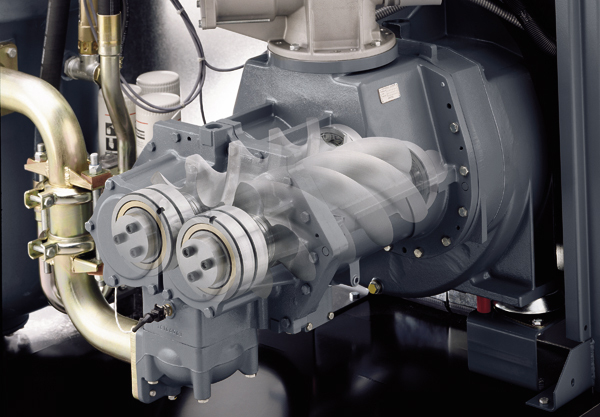 That is why they are widely used in applications such as compressors, pumps and retarders. A four-point contact ball bearing (fig. 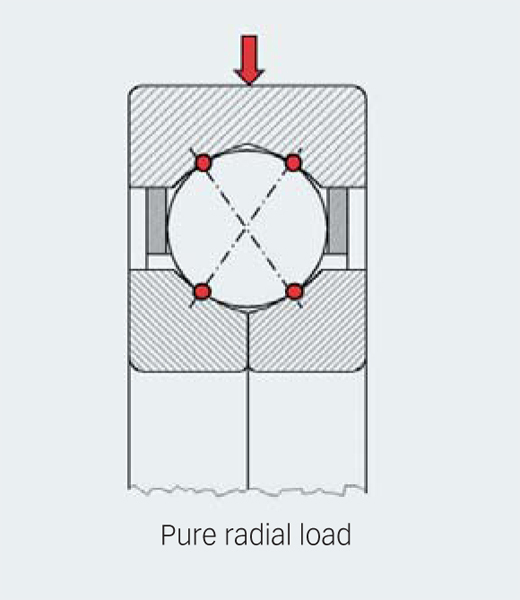 1) can accommodate axial loads in both directions, in combination with radial loads up to a certain level, and provides a very tight axial shaft position tolerance. The bearing also saves space, because it can be seen as the combination of two single row angular contact ball bearings into one. 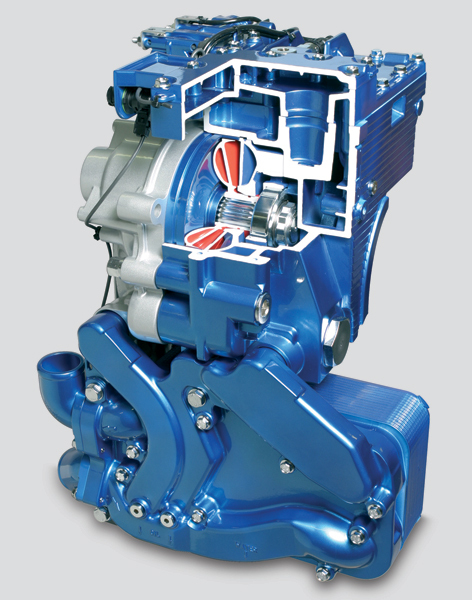 Therefore, it is an excellent choice in applications such as industrial gearboxes, locomotive drives and compressors. Standard SKF four-point contact ball bearings – also called QJ bearings – consist of a single piece outer ring, a radially split inner ring, a ball set and an outer ring guided cage. The ring designs show some remarkable details (fig. 2). The outer ring is similar to a deep groove ball bearing design, but the raceway geometry cross section is fairly different. A deep groove ball bearing raceway is circular. A four-point contact ball bearing outer ring consists of two symmetrical raceways. Each of them has a circular shape. The two raceways intersect each other in the middle of the ring in form of a singular point. The raceways form is also called “Gothic arc”. The centres of the two raceway circles have a small off-set in axial direction (fig. 2). The inner ring is split into two halves and has the same design principle as the outer ring. This provides an advantage compared to the deep groove ball bearing design. The design of the outer ring raceways allows defining the contact angle (standard 35°) and the axial clearance independently. In other words it is possible to design a specific axial clearance without changing the osculation (ratio between raceway curvature and ball diameter). 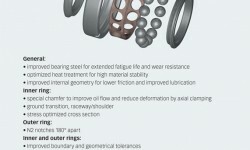 A bearing with a 35° contact angle requires high raceway shoulders and such a bearing with a single piece inner ring cannot be assembled with a reasonable number of balls. 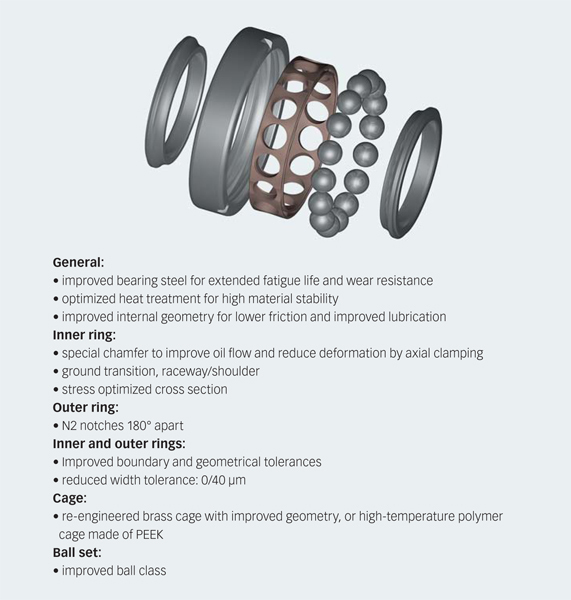 The four-point contact ball bearing split inner ring design makes it possible to incorporate a maximum number of balls, only limited by the cage bar thickness. the inner ring halves are inserted from each side. The inner rings are not self-retaining. To avoid the bearing falling apart during transport and handling, a plastic insert is pushed into the bore. Theoretically, one ball has four different contact points to the rings (fig. 3). This happens if only radial load is applied. This load case may not occur in real applications. Most relevant are load cases with pure axial load (fig. 4a); in these cases only two contact points in diagonal position transfer load. 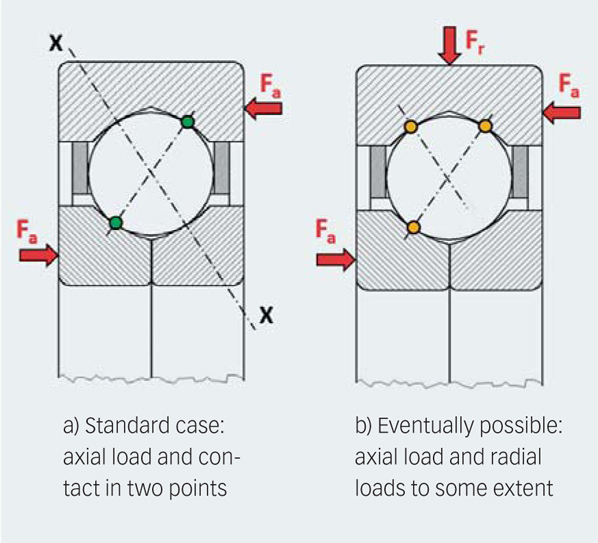 If the axial load changes its direction, the two contact points move to the opposite position. 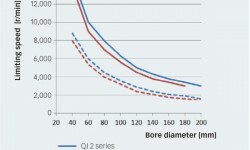 This explains why this bearing type can accommodate axial loads in both directions. There are also applications with combined loads, but dominating axial load (fig. 4b). 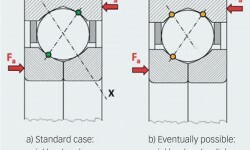 If the same functionality should be reached with single row angular contact ball bearings, two identical bearings in a back-to-back or face-to-face arrangement need to be matched. This means with a four-point contact ball bearing, space-saving arrangement designs can be realized. Two single-row angular contact ball bearings can be substituted by one four-point contact ball bearing. 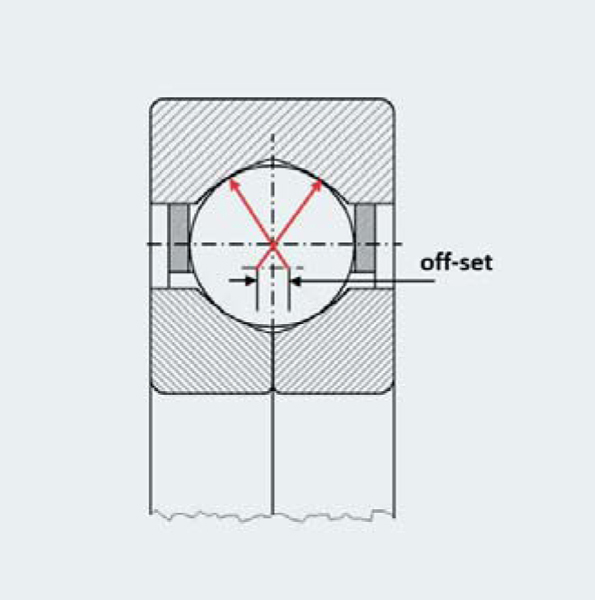 An important condition is that four-point contact ball bearings need a predominant axial load for proper function – the ratio Fa/Fr > 1,27 is recommended by SKF. SKF four-point contact ball bearings as standard are fitted either with a machined window-type brass cage (designation suffix MA) (fig. 1a) or an injection moulded window-type cage of polyether-etherketone (PEEK) (designation suffix PHAS) (fig. 1b). Both cages are outer ring guided. This gives a very good guidance, enabling to increase the speed limit. The very specific design of the symmetric cage enables to incorporate a maximum number of large balls. Fig. 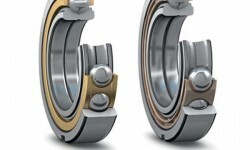 5 shows a summary of the main characteristics of SKF QJ series bearings. 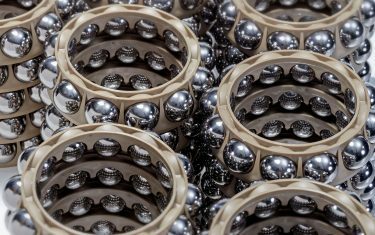 The very compact design of a four-point contact ball bearing may lead to the concern that the load rating of a matched set of two single-row angular contact ball bearings might be comparatively higher. Fig. 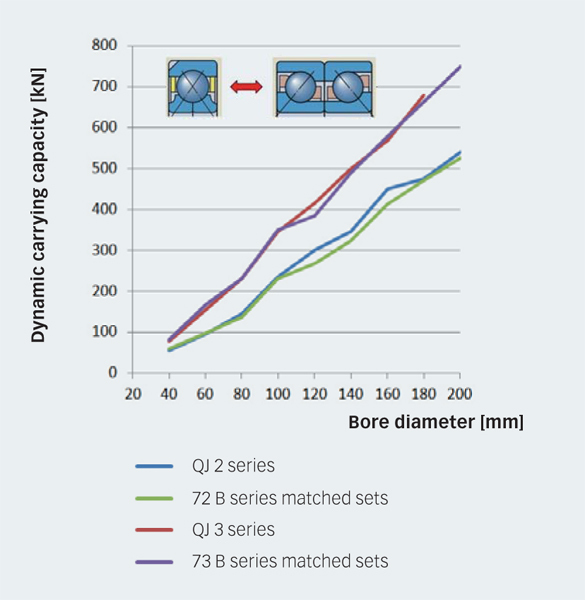 6 shows a comparison of load ratings of QJ bearings in the 2 and 3 diameter series and corresponding matched sets of angular contact ball bearings in the 72 B and 73 B series respectively. It shows that there is almost no difference between the load carrying capacity of a four- point contact ball bearing compared with a corresponding matched set of angular contact ball bearings. All in all it appears that 50 % of axial space can be saved with a four-point contact ball bearing. 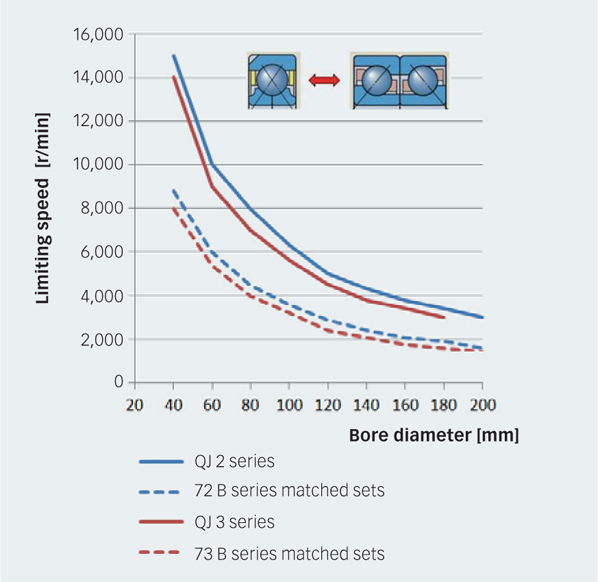 It is clear that the equivalent dynamic load for the four-point contact ball bearing will be higher, mainly due to the lower contact angle, but the resulting lower basic rating life is largely balanced by saving space in the design. Fig. 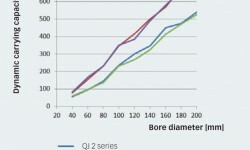 7 shows a comparison of limiting speeds between bearings in the QJ 2 and QJ 3 series versus matched sets of bearings in the 72 B and 73 B series. It clearly shows an approximate 70 % higher speed rating. This can be explained by the lower contact angle (35° versus 40°), high-quality cage material (solid brass or PEEK), an outer ring shoulder guided cage and special lubrication cage pockets. In many applications a four-point contact ball bearing is combined with a radial bearing such as a cylindrical roller bearing. 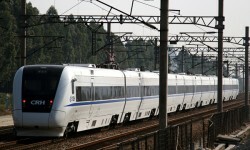 Here, it is crucial that the four-point contact ball bearing only takes axial load. 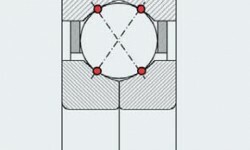 Therefore, the outer ring of the four-point contact ball bearing should not be clamped axially, nor radially, but mounted with radial clearance (a gap of 1 to 2 mm) in the housing (fig. 8). Otherwise the outer ring cannot compensate for thermal movements, which will cause unwanted additional force in the bearing. 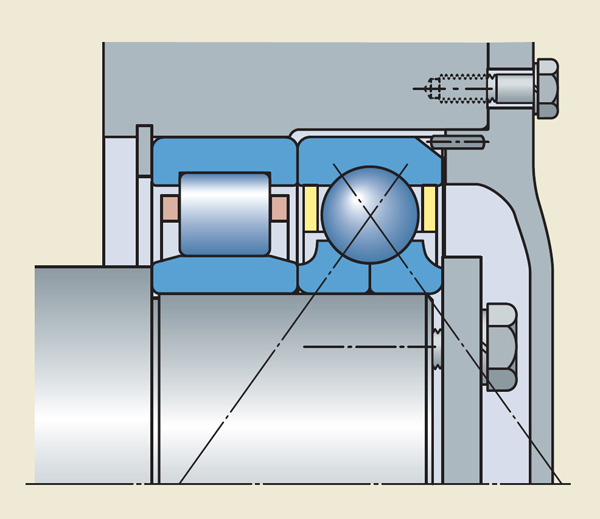 To avoid rotation of the outer ring, most bearings are supplied with two locating slots in the outer ring. This allows connection of the outer ring and housing with a pin (fig. 8). 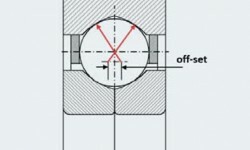 If axial clamping of the outer ring cannot be avoided, the outer ring must be at least carefully centred during mounting. Be aware that the two inner ring halves always need to be clamped axially. 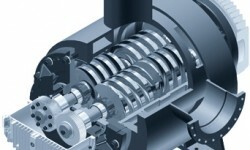 Screw compressors (fig. 9a) are used throughout the industry to compress various gases at relatively high pressure. This can be air, aggressive gases, oxygen, refrigerants and others. 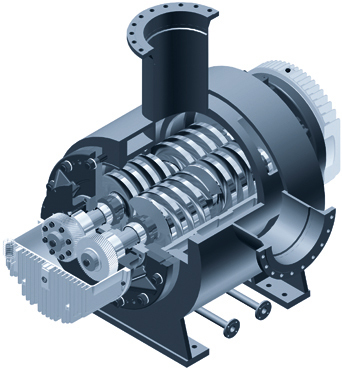 The compression process is realized by continuous rotation of two helical screws. The differential pressure between both screw ends causes axial forces that are often accommodated by four-point contact ball bearings. The narrow gap between the two screws, and between screws and the compressor housing, requests stiff bearing arrangements and small axial clearances. 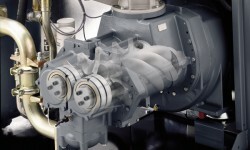 Turbo retarders (fig. 9b) convert excessive kinetic energy of trucks into heat. 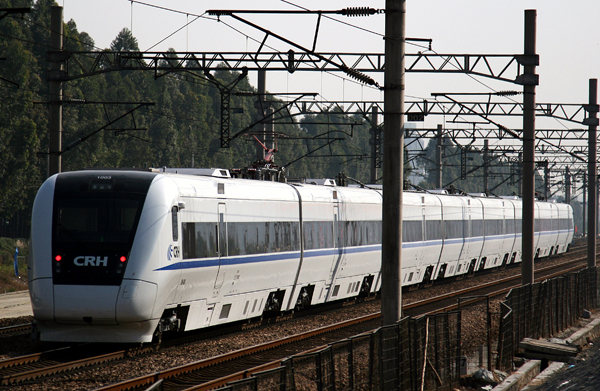 This application requires bearings with high limiting speeds and the ability to accommodate rapid speed changes, a typical application for four-point contact ball bearings. 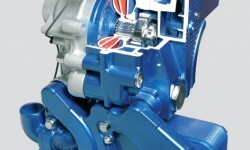 Multiphase pumps (fig. 9c) help to exploit oil fields more effectively than what is possible with con-ventional methods. The pumps are located at the bottom of the sea, and increase the pressure of the upstream oil gas mixture. 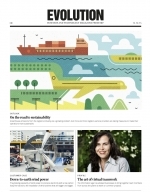 Therefore the requirements on reliability are extremely high. 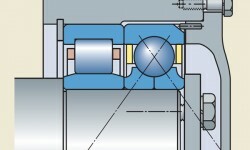 Typically four-point contact ball bearings accommodate the axial loads. 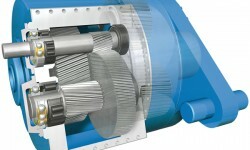 Wind turbine gearboxes (fig. 9d) transfer energy of the very slow rotating main shaft (some 18 r/min) to a generator speed that is about 100 times higher. 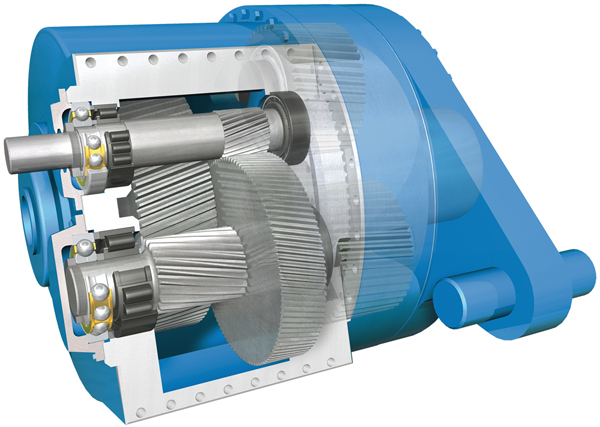 On the high-speed shaft, helical gears cause heavy axial loads that need to be accommodated. A combination of cylindrical roller and four-point contact ball bearings is used. For railway (fig. 9e) there are two main applications. 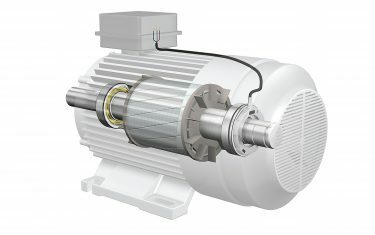 Gearboxes and traction motors often incorporate a combination of cylindrical roller and four-point contact ball bearings. 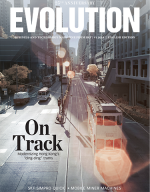 Traction motor bearings need to be protected from damage occurring due to current passage. A common solution is the use of insulated bearings (INSOCOAT). For four-point contact ball bearings with locating slots, the inner ring halves are to be coated.